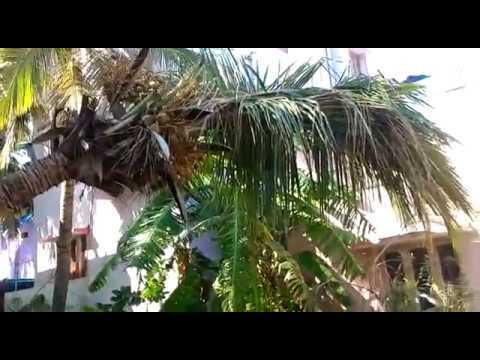 Our parental house in Chennai has 4 fully grown coconut trees. The coconuts, leaves etc., have been use by us and the surplus is usually shared with our neighbors. One of these trees in our backyard had grown tilted into our neighbor's property. Early 2016 the neighbor started constructing a villa and this tree was intruding the structure. The builders and owners approached us and requested us to cut down the tree. These trees have been living with us for more than 20 years and they are a part of our family, hence we decided to take professional help and uproot the tree and plant it in a safe place. We did this on 09-11-2016. And we were happy to have saved the tree. However on 12-12-20016, Chennai was battered by a severe cyclone- Vardah. The tree stood good for more than 3 hours but then starting giving up to nature slowly and finally fell down, now resting on a small foundation nearby. We would like to save this gentle tree, again lift the tree and let it stand with all its beauty. Your share could be as good as a donation for Shivakumar T! Not everyone can afford to take care of their loved ones. Shivakumar T's life can only be saved by donations made by kind people like you.